Plastic has become so ubiquitous in our everyday lives that we often times don’t even notice it. It can seem impossible to live without it, but it wasn’t that long ago we did exactly that. Plastic production grew in the 1940s in response to military resource needs during World War II. Once the war was over, the plastic companies needed a new customer base. 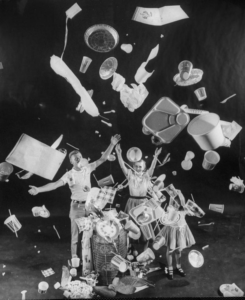 In 1955, an article titled Throwaway Livingwas published in the August 1 issue of LIFE magazine. “No housewife need bother” washing the dishes anymore – just throw them in the bin instead! Photo printed in the August 1, 1955 issue of LIFE magazine. Manufactured demand is a powerful tool. The Throwaway Living article is credited with launching our disposable society. Until this time, products were designed to last. The notion of buying something with the intention of throwing it away was absurd. The plastic companies knew this and responded by making disposability cool. 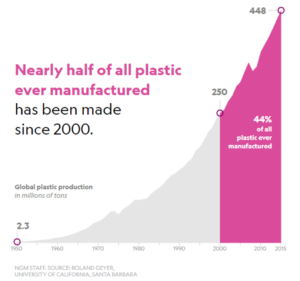 Plastic production has skyrocketed. In the last half of the 20thcentury, over one billion tons of plastic was produced. In just the first decade of this century, that figure has nearly doubled. 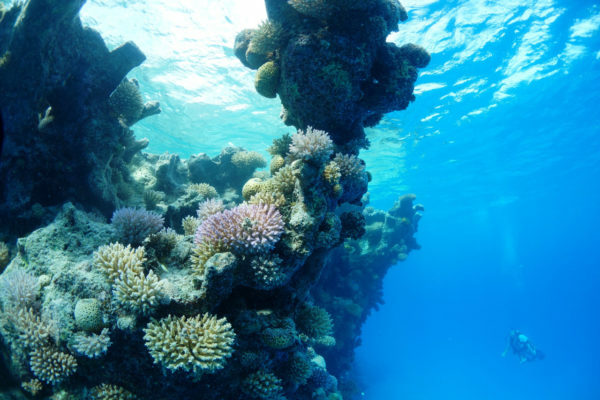 As a man-made material, plastic cannot biodegrade; every piece of plastic ever created still exists today. We have created disposable products out of a material designed to last forever. The good news is all hope is not lost. Going plastic free does not happen overnight, but there are small actions that we can all take in our daily lives to not only save the planet, but also our wallets and our time. 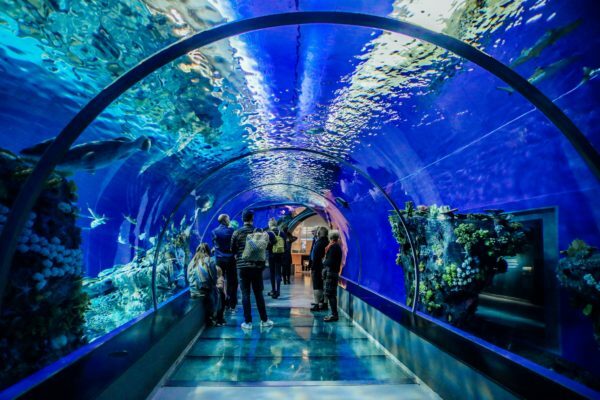 This July, the Columbus Zoo and Aquarium and Calgary Zoo teamed up to host an international zoo and aquarium Plastic Free July EcoChallenge, inspired by the Australian-founded initiative. 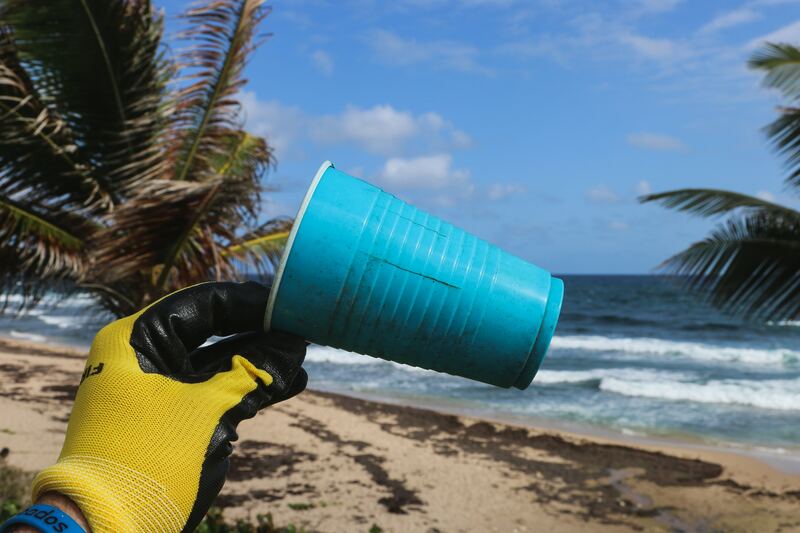 Through this challenge, 58 zoos and aquariums across North America engaged 5,242 staff and volunteers in refusing and reducing single-use plastics by making small changes that add up to huge impacts. 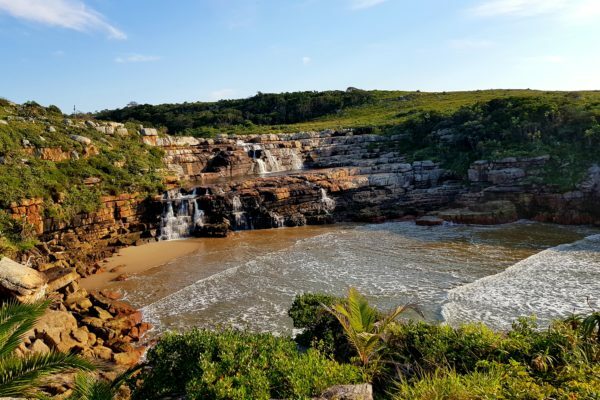 For 31 days, participants logged their plastic-free actions, celebrated their successes, and sought insight for their struggles. This collective empowerment fostered not only action during the month, but also the development of long-term habit change. Table 1. 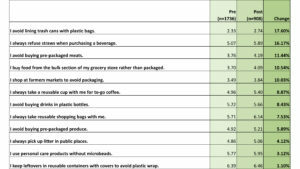 Results of the pre- and post-surveys sent to Plastic Free July 2018 EcoChallenge participants. Respondents were asked to rate their level of agreement to these thirteen statements on a scale of 1 (strongly disagree) to 7 (strongly agree). Results demonstrate that the challenge did have an impact on participant behavior and changes in habits. Another six-month post-survey will be conducted to further evaluate long-term behavior change. I’ve heard many arguments that individual actions don’t matter. This challenge proves otherwise, and the above participant story shows us exactly why they do matter. Action inspires action. Our collective action has the power to protect sea turtles, whales, sea birds, and the other amazing creatures that call our oceans home.